An earlier post discussed our Superintendent’s false statement about financial support. That post was based on the 2017 VDOE data, the latest funding data then available. 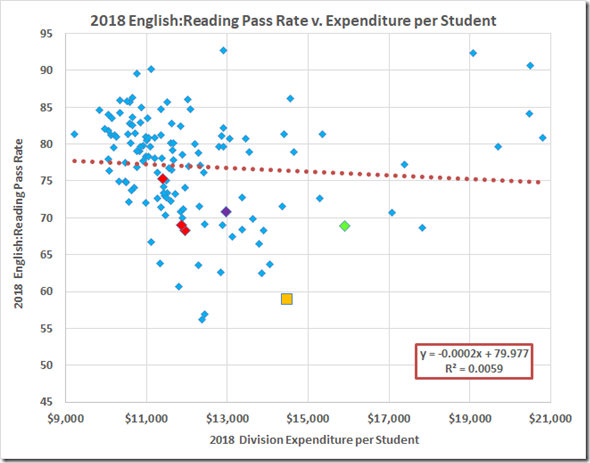 I’ve updated the post with the 2018 numbers that VDOE just posted. Virginia’s highest poverty school divisions — which serve large percentages of children of color — receive 8.3 percent less in per-pupil funding than the state’s wealthiest districts. Put plainly: The students who should be getting more are actually getting less. In fact, Virginia’s high poverty divisions (larger numbers of economically disadvantaged students) actually spend more per pupil on average than the more affluent divisions. 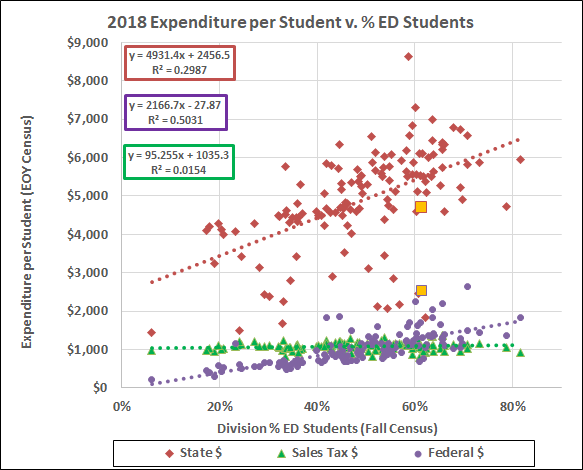 Richmond, the gold square on the graph, spends $2,219 more per student than the fitted line would predict; indeed, it is the fourteenth biggest spender (of 132). 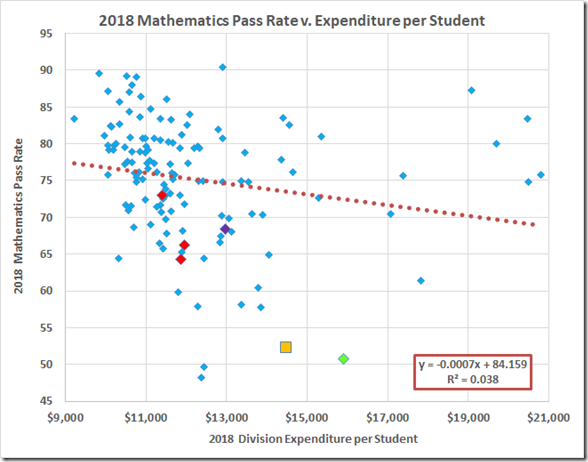 The immediate lesson here is that Superintendent Kamras is simply wrong about high-poverty schools being starved for outside funds: The sales tax funding is essentially flat v. % ED while the state appropriations and the federal funding increase with increasing % ED. Indeed, the R-squared value on the state funds, 30%, implies a meaningful correlation; the federal value, 50%, is robust. Richmond, the gold squares, is a bit low in terms of state funding, but that deficit is offset (and then some) by federal money. Richmond’s sales tax funding, $1,071 per student, is hidden in the forest of other schools, almost exactly on the fitted line. Only in local funding can we find any hint of support for the notion that divisions with more poor students receive less money. Of course, it would be no surprise that less affluent jurisdictions might provide fewer funds to their school systems. For the most part, they have less money to spend on any governmental operation. 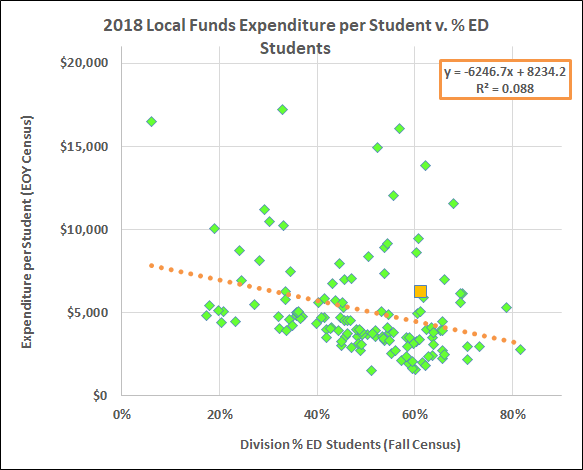 Kamras’ own division, with a 61% ED population in its schools, noneltheless came up in 2018 with $1,806 in local funds per student more than that fitted line would predict. As well, when all the fund sources are added in, the average spending on education increases with increasing populations of disadvantaged students. 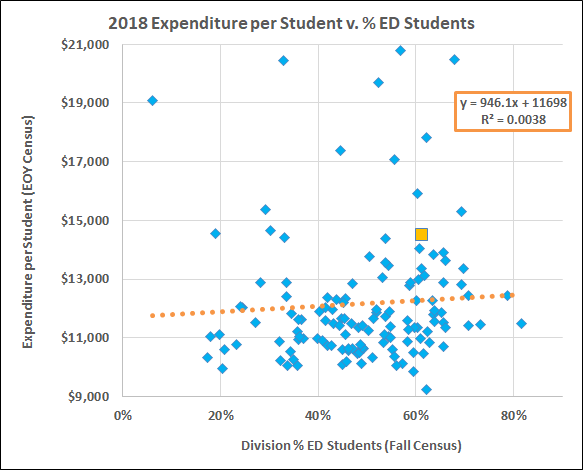 The R-squared, however, tells us that expenditure and ED percentage are essentially uncorrelated. See the graph at the top of this post. So, when he says “The students who should be getting more are actually getting less,” our Superintendent is wrong. And, even more to the point, Kamras’ own schools are enjoying much more than average financial support. Richmond again is the gold square, spending lots of money and getting lousy results. 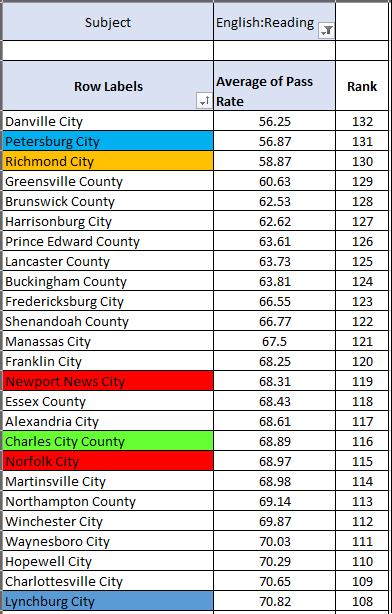 For comparison, the peer cities are the red diamonds: from the left, Hampton, Norfolk, and Newport News, all spending much less than Richmond and getting much better outcomes. As a courtesy to my readers there, the violet diamond is Lynchburg, the green, Charles City. It would be helpful for our Superintendent to turn his energy to improving the performance of our schools and to stop misleading the public about the reasons those schools are so ineffective.